A complex number is an algebraic extension that is represented in the form a + bi, where a, b is the real number and ‘i’ is imaginary part. They are used to solve many scientific problems in the real world. Complex numbers can be added, subtracted, or multiplied based on the requirement. Further, this is possible to divide the complex number with nonzero complex numbers and the complete system of complex numbers is a field. You would be surprised to know complex numbers are the foundation of various algebraic theorems with complex coefficients and tough solutions. The concept of complex numbers was started in the 16th century to find the solution of cubic problems. Gradually, its application was realized in other areas too and today, this is one of the most popular mathematics technique used worldwide. In mathematical geometry, Complex numbers are used to solve dimensional problems either it is one dimensional or two dimensional where the horizontal axis represents the real numbers and the vertical axis represents the imaginary part. 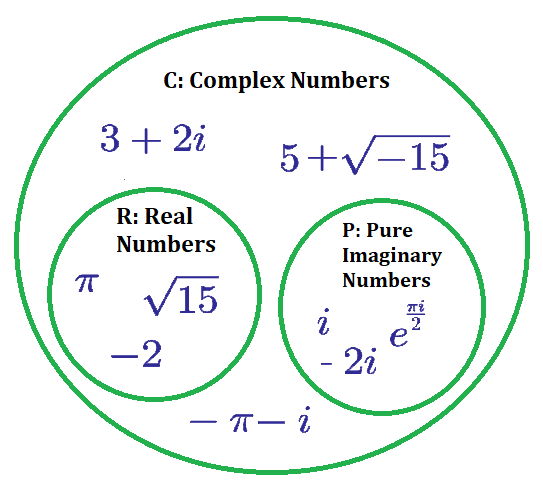 There are cases when the real part of a complex number is a zero then it is named as the pure imaginary number. As discussed earlier, it is used to solve complex problems in maths and we need a list of basic complex number formulas to solve these problems. A complex number can be shown in polar form too that is associated with magnitude and direction like vectors in mathematics. The real-life applications of Vector include electronics and oscillating springs. in = i, if n = 4a+1, i.e. one more than the multiple of 4.
in = -1, if n = 4a+2, i.e. two more than the multiple of 4.
in = -i, if n = 4a+3, i.e. Three more than the multiple of 4.
in = -1, if n = 4a, i.e. the multiple of 4. A complex number equation is an algebraic expression represented in the form ‘x + yi’ and the perfect combination of real numbers and imaginary numbers. You need to put the basic complex formulas in the equation to make the solution easy to understand. Why complex Number Formula Needs for Students? There are multiple reasons why complex number study is beneficial for students. Let us discuss a few reasons to understand the application and benefits of complex numbers. The most important and primary application of Vector is electric current measurement so they are widely used by the engineers. The other important application of complex numbers was realized for mathematical Geometry to show multiple transformations. They are used by programmers to design interesting computer games. If you wanted to study simple fluid flow, even then a complex analysis is important. Complex number concepts are used in quantum mechanics that has given us an interesting range of products like alloys. LEDs, laser products, genetic engineering, silicon chips etc. This is possible to design all these products without complex number but that would be difficult situation and time consuming too. The calculations would be lengthier and boring. So, the best idea is to use the concept of complex number, its basic formulas, and equations as discussed earlier. Learning complex number is a fun but at the same time, this is a complex topic too that is not made for everyone. If you want to deeply understand Complex number then it needs proper guidance and hours of practice together.